Everyone wants to be clean, but what soap should you choose? 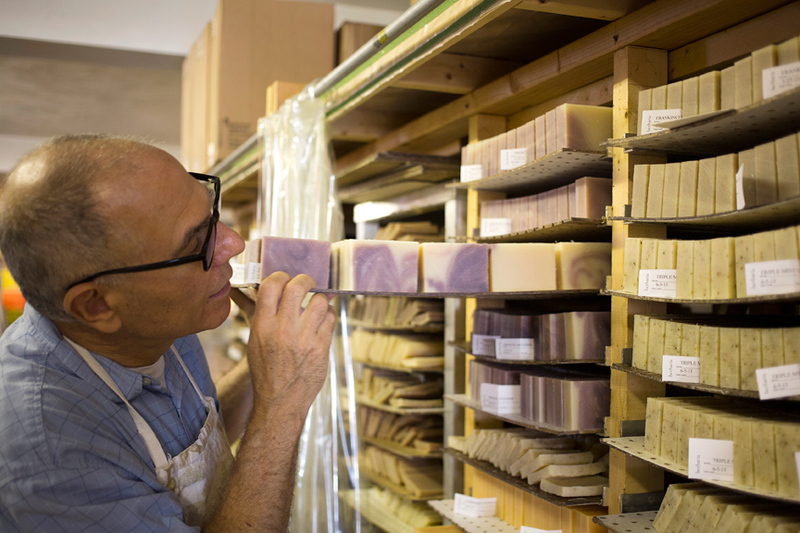 The answer doesn't matter at Herbaria, because all their handmade soaps are people friendly. Customers hop from one bar to another, to try out all the wonderful herbal scents. 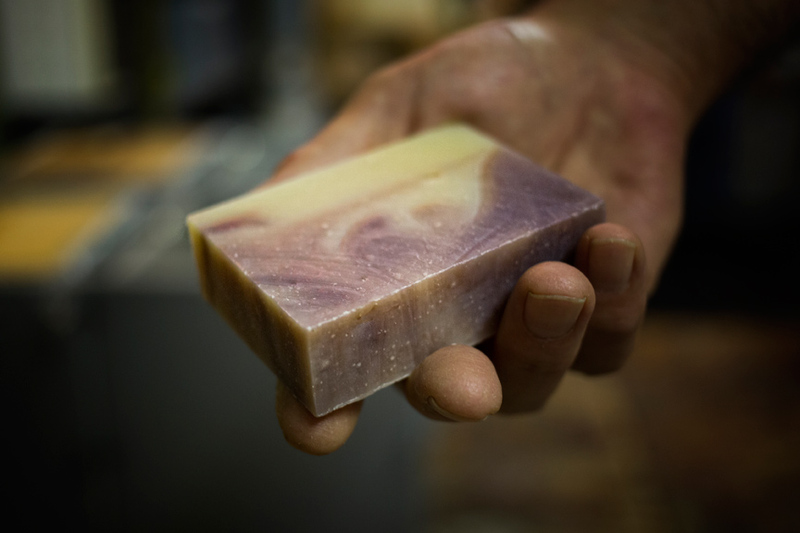 The Herbaria soapmakers leave out the artificial fragrances, colors and harsh detergents, and instead include nourishing natural oils and healing herbal essential oils to produce soaps beneficial to the skin. The company has its origins in 2002, when Ken Gilberg's wife, LaRee DeFreece, didn't like the soaps that were available in stores, with labels listing unpronounceable artificial ingredients. 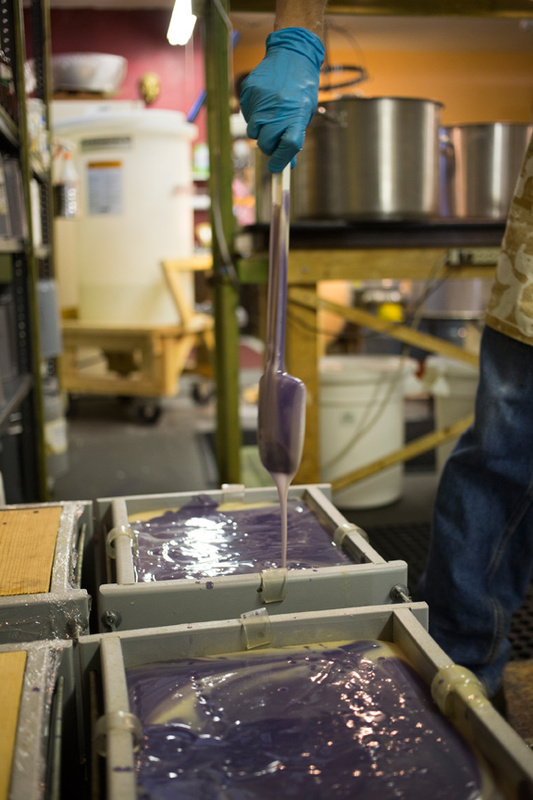 Taking action, she bought some books, experimented and learned to make her own soap. She gave away extras to friends, who loved the bars. Encouraged, she made more, and sold her soaps at the annual Best of Missouri Market. 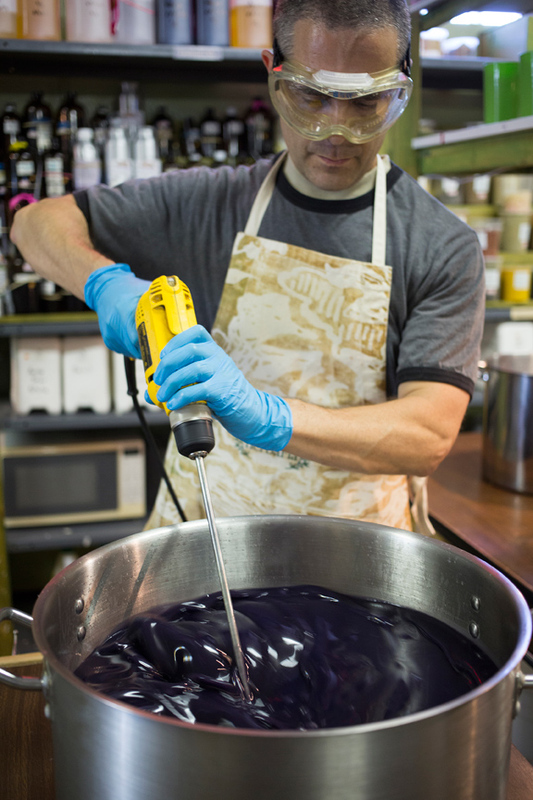 Soon after, she started a new job, so Ken took over making the soap in the basement of their Kirkwood home. With lively online sales, Herbaria expanded at a fast pace. They now ship to every state and a number of foreign countries. 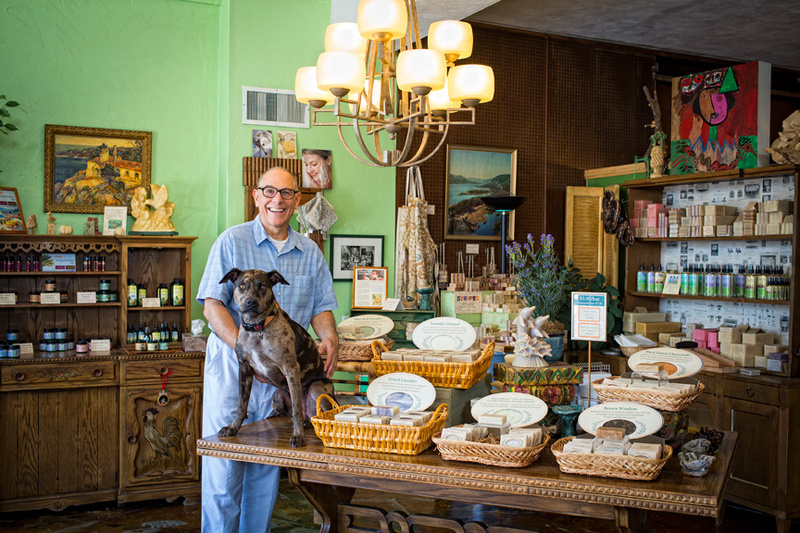 In 2009, they moved to a storefront on The Hill, at 2016 Marconi Ave.
Herbaria offers a dazzling array of over 50 soaps, as well as beauty masks, scrubs and moisturizers, bath bombs and salts, natural insect repellents, laundry and shaving soaps, pet products and even deodorant. For those who have a hard time deciding, they sell sampler stacks, which include six different scented soaps. 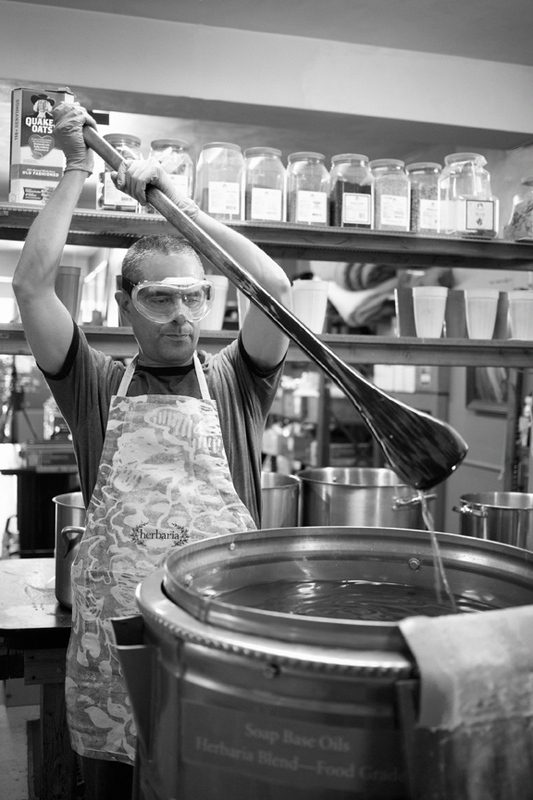 For Ken, the most important part of the business is using natural ingredients. “We're all about the plants. We use the real thing, and your body knows it. Artificial fragrance oils are the number one cause of skin irritation,” he notes. “So many people have eczema, or are allergic to synthetic chemicals.” He researches the properties of each plant before using it as an ingredient, to make sure it is beneficial to the skin, and comes up with some creative blends. Tomato Surprise soap includes dried tomato because the lycopene in tomato is a powerful antioxidant. Spearmint Orange is a natural tension relaxer due to the menthol contained in the spearmint; an added benefit is that it helps open the sinuses. Pink Grapefruit includes the skin-toning benefits of real grapefruit. 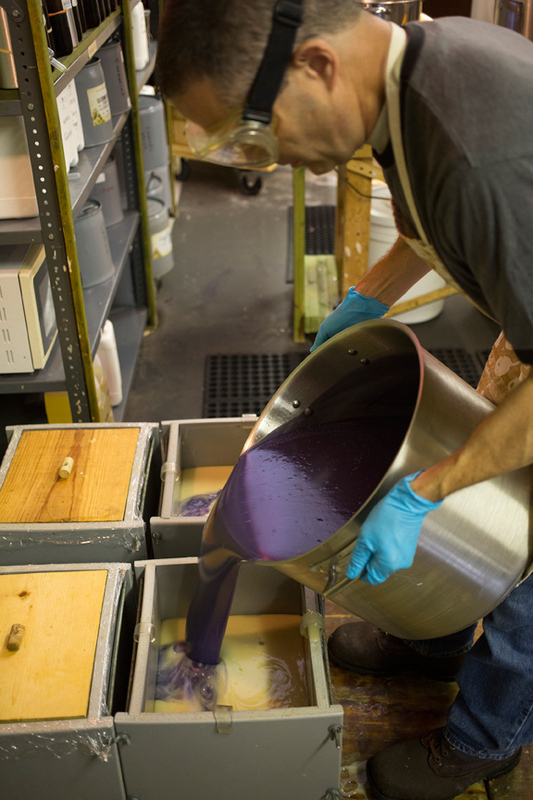 Their best-selling soap, Lavender Oatmeal, is prized not only for its wonderful scent, but also for its antibacterial and exfoliating properties. Their website, www.herbariasoap.com, lists the ingredients in each bar so customers know exactly what they're getting.